Fighting Washington for All Americans: House Republicans' recess playbook. 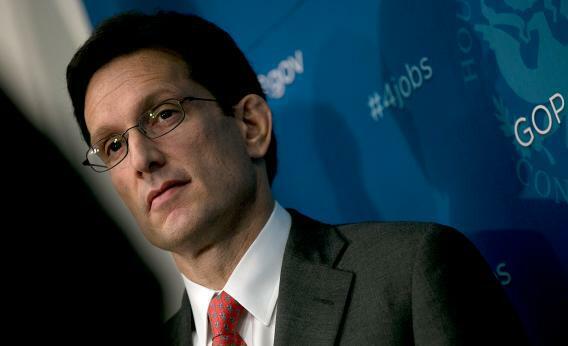 One directive from House Republicans’ Congressional recess playbook: Drum up support for a dead bill pushed by House Majority Leader Eric Cantor. Invite local 501(c)3 and 501(c)4 group leaders to your district office to hear stories of how they could have been targeted by the IRS. Hold a one-hour closed press meeting to listen to their stories and discuss House Republicans’ oversight efforts. Following the meeting, hold a press conference with local media. The “could have been” does a lot of work there. Plenty of districts have Tea Party groups that struggled for years to get tax-exempt status. But all of them have groups that could have struggled. Among the other ideas here: Hold a meeting to promote the Working Families Flexibility Act, an Eric Cantor brainchild that altered flex time rules—or would have, had the Senate not aborted it. Republicans are told to round up businesses then “secure a location for the roundtable at a place where working parents could spend time if they had more flexibility (a home, Little League playing field, school auditorium, etc).” They’re told as well to tour some medical facility to advertise the “local, real-world detriments of the President’s health care law.” Interestingly, there’s nothing focused on the next stage of an economic agenda in Congress, even though we’re closing in on another debt limit deadline and the president’s spending this week (and presumably more of the summer) banging that gong.